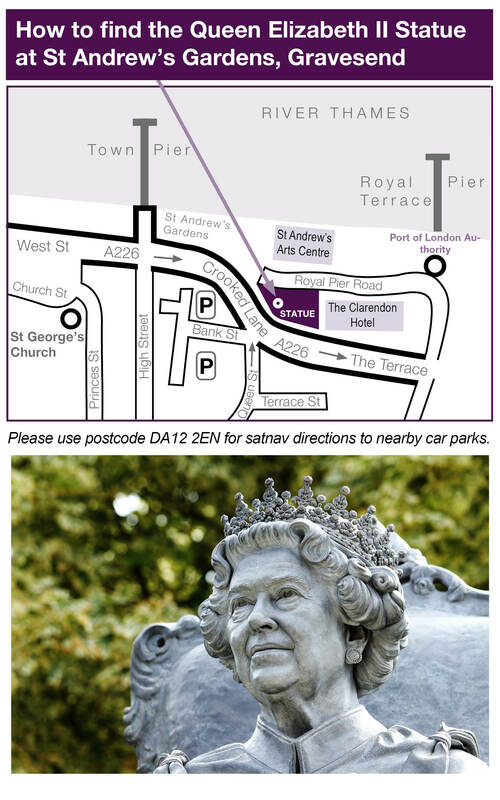 A statue of Queen Elizabeth II was unveiled at St Andrew’s Gardens in Gravesend on Thursday 26 July 2018. History was made with the unveiling of Gravesham Borough Council’s statue of Her Majesty Queen Elizabeth II to celebrate our longest reigning monarch. The statue, sculpted by Douglas Jennings MRBS, was jointly unveiled by the Rt Rev James Langstaff, Bishop of Rochester and Bishop of H.M. Prisons and Cllr David Turner, Honorary Freeman of the Borough and Leader of the Council on 26 July 2018 at 10am in St Andrew’s Gardens, Gravesend Kent. Dr Bhargawa Vasudaven DL also attended the unveiling, representing The Lieutenancy of Kent. 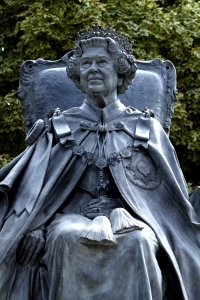 The magnificent statue portrays the Sovereign in her Order of the Garter robes and is thought to be the only seated sculpture of Queen Elizabeth II in existence. 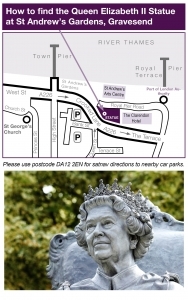 Originally commissioned in 2016 to celebrate the Queen’s 90th birthday, the statue will commemorate Queen Elizabeth II who became the longest reigning British monarch on 9 September 2015 and the world’s longest reigning current monarch on 13 October 2016. On 6 February 2017 she became the first British monarch to celebrate a Sapphire Jubilee commemorating 65 years on the throne. The statue, made of bronze, is visible to pedestrians, passing motorists and from the river. It is 2.57m tall, one and a half times life size, and weighs 700kg. The statue stands on a seven tonne, 1.52m plinth made of Portland Stone. The cost of the statue is £225K which has been entirely funded by local businesses and individuals including Edinburgh House, Esquire Development Ltd, G&M Motors, Guru Nanak Darbar Gurdwara, Hatten Wyatt, Istead Rise Community Association, Kimberly–Clark, LEJ Properties, Port of London Authority, and Reef Estates Ltd as well as other individuals and businesses who have requested anonymity. The sculptor, Douglas Jennings MRBS, received the Marsh Award for Excellence in Public Sculpture in 2015, for the statue of Squadron Leader Mahinder Singh Pujii, which is also in St Andrew’s Gardens, Gravesend on the river front. He has developed detailed figurative monuments for public figures in the world of sport, public service and politics and is well known for his highly skilled, lifelike sculptures and drapery. He said: “Gravesham Borough Council approached me about designing a commemorative statue of Her Majesty Queen Elizabeth II following the success of the memorial statue I created of Squadron Leader Mahinder Singh Pujii. Douglas said: “The site where the statue is to be placed will enhance an already beautiful and tranquil spot. I look forward to seeing how the statue becomes part of the area and enables those in the community to celebrate a monarch that has reigned over three generations in such a steadfast and inspirational way. As Head of the Commonwealth it is fitting the Queen’s statue is placed by Squadron Leader Pujii who represents all those from the Commonwealth who served alongside Britain in all conflicts. “As the Queen’s 65th year reign was recently celebrated and many milestones have been met, including longest serving monarch, it felt fitting to include many of the symbols associated with the monarchy. It was a wonderful opportunity to have the Queen seated wearing her official Order of the Garter robes and regalia, echoing the style of several statues of her grandmother Queen Victoria.